August 2013 - Midwest Sports Publishing Network, Inc. Exactly 40 years day-for-day after the first million. Valcourt, Québec, August 30, 2013 – BRP produced yesterday its three millionth Ski-Doo snowmobile, the 2014 Ski-Doo Summit X E-TEC 800R model, in its Valcourt, Québec manufacturing facility, 54 years after the Ski-Doo snowmobile was born in 1959. It has been exactly 40 years, day for day, since the millionth snowmobile, a 1974 Ski-Doo T’NT Everest 440 model was produced, and 20 years since the second millionth, a 1994 Ski-Doo Summit snowmobile. The 3,000,000th Ski-Doo snowmobile was originally destined for the European market. It will instead join the millionth and two millionth Ski-Doo sleds at the J. Armand Bombardier Museum in Valcourt. Coincidentally, the 2 and 3 millionth snowmobiles are both Summit models. The original Ski-Doo Summit snowmobile was the first OEM sled designed specifically for the unique character of mountain snowmobiling. In the model’s 20th anniversary year, BRP is still leading the mountain snowmobile segment with the most specialized sled in the market. 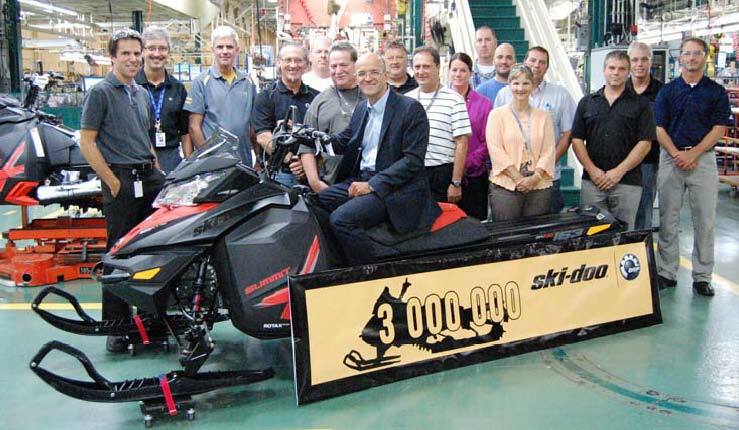 See the production of the 3 millionth Ski-Doo snowmobile: http://youtu.be/pMPR3ln2ioY. Loren Anderson turns over the leadership of the Hall of Fame to Craig Marchbank, newly elected President of the Board of Directors. 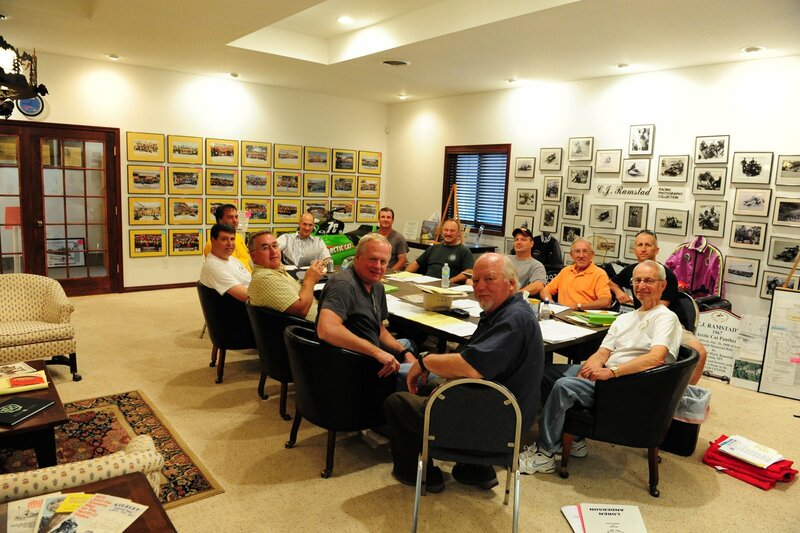 St. Germain, WI – The Board of Directors of the Snowmobile Hall of Fame and Museum (SHOF), held their annual summer meeting in the SHOF Ramstad Conference Room Sat, Aug 10, 2013. It was area resident Loren Anderson’s last meeting as president of the non-profit organization, founded in Minocqua in 1981-82. Loren served as president for over 30 years. The SHOF has operated a HOF and museum for the last 21 years in St. Germain and was in Eagle River and Minocqua for short periods as well. What began as a trail ride with C J Ramstad, the publisher of several snowmobile magazines in the early 80’s, ended up with Loren, local racer and businessman Mike Trapp and Larry Bosacki of the famous Boathouse, deciding they should start a HOF for the spot. It was one of those moments: “If not us, who. If not now when?” Thirty years later, some 100 inductees have been enshrined and the organization owns their own land and building on a beautiful wooded campus on Saint Germain’s west side on Hwy 70. The collection of sleds in the museum, is well respected throughout the world as one of the most prized and valuable collections in the sport. Besides serving as leader of the SHOF, Loren managed a career in the building, land development, real estate and design field. He spent some 12 years racing Formula I sleds, owning a race team his son raced on and serving on snowmobile related boards and commissions. His long and busy career included a stint as Legislative Chair of the Wisconsin Builders Association and a director of the National Association of Home Builders in Washington, DC. Two of the Anderson firms’ buildings won national design awards from the ARA. Loren also worked for Gov. Tommy Thompson as an administrator in the Dept. of Commerce for four years and later at State Fair Park on the board and as race director, where he is one of the people credited for saving racing at the Park and keeping the famous Milwaukee Mile alive, bringing back NASCAR and Indy Car racing. During these years, he also managed to serve as presidents of the Lake Geneva, Minocqua and St. Germain Chambers. He was a founding member and chairman of the Faith Ev. Free Church in Minocqua. Loren’s wife Carola worked along his side for over 20 years helping as volunteer and office worker. Until two years ago, the SHOF had no paid employees as all work has been done by volunteers like the Andersons. The SHOF board had a work day prior to the meeting, moving some 30 sleds around and made ready for a new and spectacular display of speed sleds including the three famous and historical Boss Cats. The SHOF has over 200 sleds available for display but only around 100 are on display at any one time. The board members come from as far as Massachusetts, North Carolina, Minnesota, Illinois, Michigan and Wisconsin. Craig Marchbank of New Lennox, Illinois and Tomahawk, Wisconsin was elected to serve as new president of the Board. Craig has been a life-long sled head and was the longest serving factory driver for Ski-Doo drag racing efforts, having just retired a few years ago with the most Ski-Doo wins in history. He also has an extensive vintage sled collection. Craig is a paving contractor. Crag said he, “… looks forward to serving and helping the SHOF as it enters its next thirty years, preserving the history and honoring the heroes of the sport.” He also reminds everyone that the raffles have started for a beautiful 1978 John Deere Liquifire and a 2014 Arctic Cat. 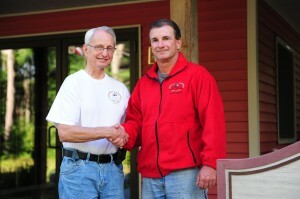 Visit the SHOF web site at www.snowmobilehalloffame.com for information. Tom Otte, of Randolph, Minnesota was elected to fill the remaining term as vice president as Jon Carlson, of Mooresville, North Carolina, has retired from the board as well. Tom is a seed farmer and vintage collector, featuring John Deere sleds. Tom had been a factory racer for Deere in the 70s. The Hall of Fame will be celebrating their 31st annual RIDE WITH THE CHAMPS, sponsored by Modine HotDawg Garage Heaters, and inductions on February 15, 2014. The SHOF operates a year around museum on Highway 70 W in St. Germain, Wisconsin. Hours are 10-5 Thursday- Friday, 10 a.m.-3 p.m., Saturday. Minneapolis, Minnesota (August 21, 2013) – With the first event on the 2013 Mystik Lubricants Terracross Championship in the books, it’s time to look forward to seeing Terracross on CBS Sports Network. Editing is complete for the races that took place at ERX Motor Park in Elk River, Minnesota this August 10-11, and air dates have been released. Sunday, August 25, 11 a.m. and 10 p.m.
Sunday, September 1, 9:30 p.m.; Friday, September 6, 2 p.m. 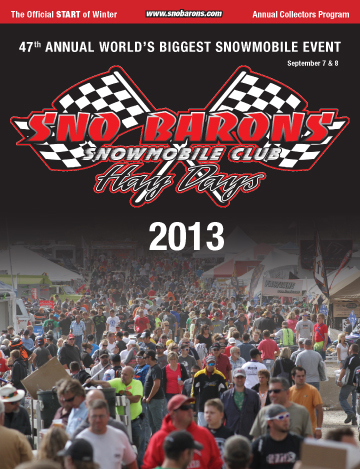 The next event on the Terracross Championship schedule will take place September 7-8 at SnoBarons Haydays in Sunrise, Minnesota, located just north of Minneapolis. Mark these dates on your calendar to see all the Mystik Lubricants Terracross Championship action! For more info on CBS Sports Network visit www.cbssportsnetwork.com. For more information on the Terracross Championship visit www.terracrossracing.com. Valcourt, QC, August 21, 2012 – BRP introduces an industry first mobile Parts, Accessories and Clothing (PAC) exhibit focused on educating the consumer and showing a broad selection of new Ski-Doo accessories and technical riding gear available for sale through Ski-Doo dealers. The BRP Riding Gear & Accessories Knowledge Centre tour truck will hit the road this fall at select events. The exhibit will offer a chance for snowmobile customers to discuss directly with BRP experts about the proper accessories and riding gear they need for the upcoming season, the technologies behind our products and their competitive edge on the market. Consumers will also be able to browse various digital tools from BRP, such as store.skidoo.com, and Build Your Own Vehicle (BYOV) while learning about current promotions and PAC programs; i.e. the TNT Jacket and Bib promotion that is only available at an authorized BRP dealer. For information on all the genuine BRP accessories to fit your ride, visit www.store.ski-doo.com or your local Ski-Doo dealer.